Last week we visited Charlie, Kathleen and Ryland in Santa Monica and had a wonderful time. 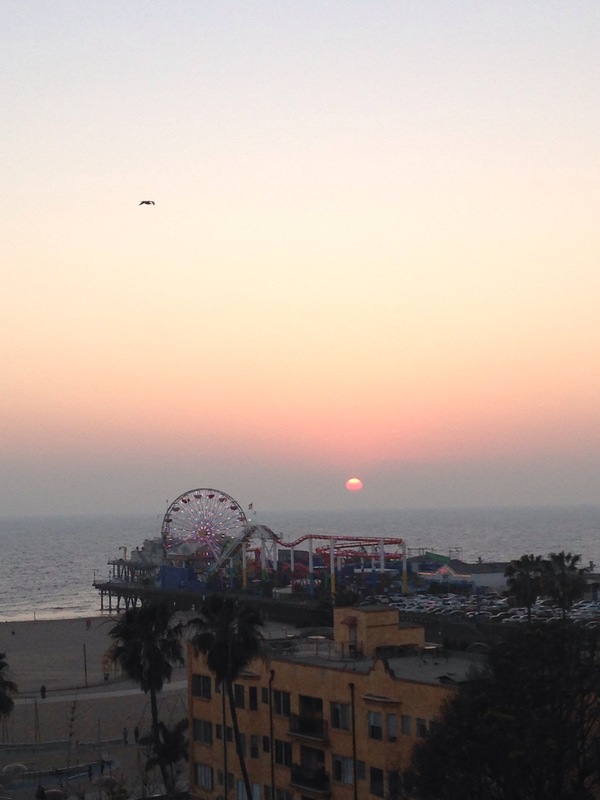 We stayed at Loew’s Santa Monica Beach Hotel. Some of our friends will remember that is where we had the rehearsal dinner almost eight years ago when Charlie and Kathleen got married so it was pretty neat to be there again. The photo below is a view of the beach from our room. Also there is a photo of Gorman and Ry playing checkers in our room. 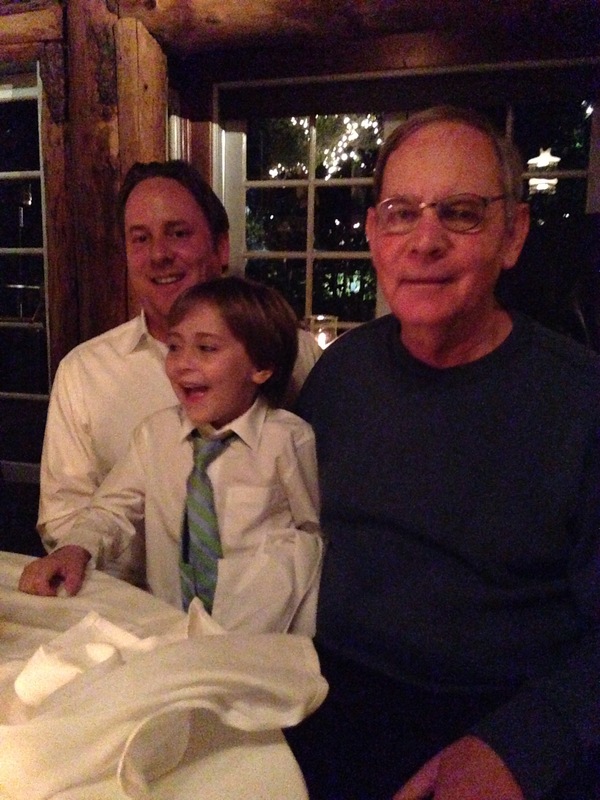 We celebrated Charlie’s 43rd birthday with dinner at the Saddle Peak Lodge, a lovely restaurant up in the Santa Monica mountains (see my three guys below). I picked up Ryland from kindergarten every day and took him to get an ice cream sundae. Gorman and Charlie went out to the Northern Trust Open golf tournament one day and saw some big-name golfers. An exhibit of many paintings from The Hudson River School was showing at the Los Angeles County Museum of Art so I drug everybody out to see that and it truly was stunning. That city is amazing in all that it has to offer. Also the weather was delightful, sunny and about 70 degrees every day. OK, that’s the end of the travelogue but it was good to be distracted and be with loved ones the week before the MRI. Today we had an appointment with the oncologist, Mike Meshad. 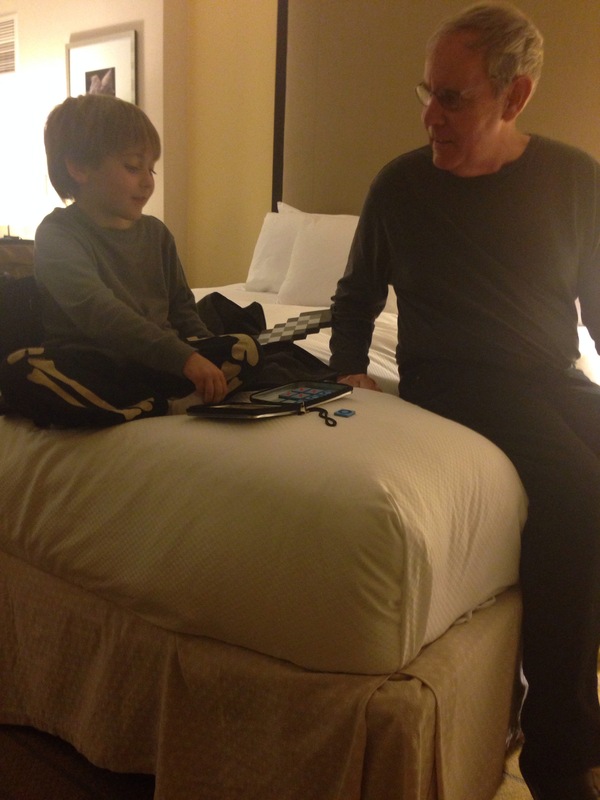 When he walked in the room he said, “Gorman, you are amazing! We shouldn’t be having this conversation; you shouldn’t be alive!” Well, that was a little unnerving but we got his point. The fact that Gorman was diagnosed with Stage Four Glioblastoma three years plus one month ago and is still here is really unusual. We discussed whether to continue with the Avastin infusions. Mike said they have no studies of patients this far out and he couldn’t make a recommendation one way or the other so we all decided there was no need to stop what seems to be working! It doesn’t make him sick and he has had no side effects. If nothing else, the fact that he’s getting some kind of treatment helps him psychologically and that’s worth a lot. So we will keep thanking God for every day that He gives us and, as Gorman says, go forth hopefully and gratefully. Posted on February 26, 2015, in Uncategorized. Bookmark the permalink. 3 Comments. I called Chuck(Poole) shortly after your last blog filled with good news came. He immediately said, “No doubt but this news is a miracle. They still happen.” We both agreed that the power of prayer can never be underestimated. So once again we are praising His name and our prayers continue. AWESOME! KEEP TAKING THE AVASTIN AND THANK GOD FOR EACH AND EVERY DAY WITH FAMILY AND FRIENDS!